A delicate white chocolate made with pure, undeodorised Madagascan cocoa butter. This rich and creamy chocolate is surprisingly full of flavour for a white. Using undeodorised cocoa butter means that the chocolate has a much greater depth of flavour. 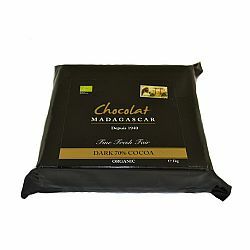 The indulgent chocolate has a thick buttery texture and a light fruity note. This chocolate doesn’t just taste good, it does good. Buying cocoa direct and producing the chocolate locally, brings the local economy four times the income of Fair Trade chocolate. This a 1kg block of organic white chocolate couverture. Cane Sugar, Cocoa Butter , Pure Cow Whole Milk Powder, Emulsifier: GMO Free Soya Lecithin 0.5%.